I wanted to surprise my niece and nephew with a custom double sided puzzle based on their artwork for an upcoming gallery show themed All Animals Great & Small. My niece created "My Bailey" which was to honor the memory of her dog, using colored pencil and watercolor. My nephew created "The Green Roar" dinosaur using pencil and watercolor. To go along with the puzzle I was also able to design a custom box cover. 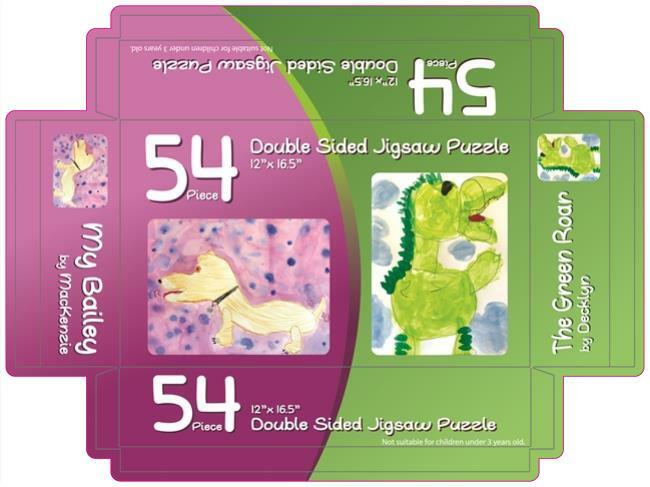 While the company I ordered the puzzle from www.createjigsawpuzzles.com does have template options available, I wanted the box to feature both pieces of art equally and be my own unique layout to make these more special. I based the design on the prominent colors in the kids artwork and found a font that looked playful and fitting for the puzzle theme. I submitted my order with the company - and got great support on the uploading of the large box design files from their customer service team. A few days later I got the update saying the order had shipped and it was on my doorstep ahead of time. I was able to give the kids each their own copy of the puzzle for Easter. I was so impressed with the quality of the puzzle. The pieces are a nice thickness and have a great gloss finish to them. All of the pieces go together nicely and its really cool to have the two puzzles in one. I had one more puzzle produced so they could donate it into the raffle at the gallery show opening. I knew they would feel so proud when they see tickets stacking up in their raffle box of folks trying to win their puzzle. And here they are with the winner, our art guild founder and president, Ed Smith! Congrats Ed!